In June of 2000, I left the classroom to join what seemed at the time to be a risky dot com venture working in the education space. I never intended to keep this job. Earlier in the year, I had made the decision to move from my home in Santa Clara to buy a new house in the rapidly expanding suburbs just north of Sacramento. Because of the timing of the move-in date, I would need a “bridge job” in order to secure a home loan. I admit, this was a little shady on my part, but the purchase of the home would occur well before the period when school districts typically hire teachers. So that winter I did a quick search on Monster.com, found an “edtech” job, arranged a brief phone call with the hiring manager at the dot com, and after a single 45-minute interview, was offered a job with a June start date. Later in the year I proceeded to interview with school districts in the new locale, intending to quit the dot com gig once I found a teaching position. But by the time calls started coming in from districts in late July, just a month after I started the dot com job, it was clear to me that this new company was onto something big and I decided to stick around for the ride… and what a ride it was. The company was PowerSchool. Over the next twelve years I would wear a variety of hats, travel to 46 states to meet with educators, work under six different CEO’s or division presidents and live through two acquisitions, first by Apple in 2001 and then Pearson in 2006. * Today PowerSchool supports more than 13 million students in all 50 states and 65 countries. For perspective, Infinite Campus, the number two SIS, supports 6.5 million students. Few people understand the scale or complexities of modern-day student information systems. Most regard the SIS as little more than a database that sits in the back corner of a cold room spitting out report cards and transcripts, and occasionally compulsory state reports. But an SIS is so, so much more. It’s where most K-12 data is born. It’s where grades are stored and GPA’s are calculated. It’s the grade book for the majority of teachers in America. It’s where discipline events are logged, health records are stored, attendance monitored and special education programs tracked. Put simply, the SIS is the hub of a school or district’s operations. To get a sense of the full scope of a typical SIS, check out the requirements matrix from Aldine ISD in Texas. Nope… There’s no app for this. The SIS is also where school schedules are created. This one aspect of the SIS is so big, so complicated that it typically requires its own product development team and specialized trainers. The scheduling rules, calendars, bell schedules, resource constraints, room capacities, student course requests, and teacher preferences of a typical high school are enough to boggle the mind. When things go sideways with scheduling, it usually makes for big news. Can you imagine an entire high school spending its first week of school with kids essentially killing time in holding pens? It’s happened before and it will happen again. In my experience, this usually happens when a school or district undervalues the importance of the SIS and doesn’t assign a senior-level administrator to take ownership of it. Finally, the SIS is one of the top three communication channels between teachers, parents and students. (#1 and #2 being the telephone and email.) As early as 1997, parents and students were using the SIS to view real-time grades, class assignments and attendance. If we were to compare the weekly active user count of some of the hot new apps like Remind, Class Dojo or Edmodo, I suspect they’d pale in comparison to what you’d find with systems like PowerSchool or Infinite Campus. When I was Product Manager for the mobile app development team at PowerSchool, students were averaging twelve logins a day. On Twitter, many students were confessing that they were using PowerSchool more than Facebook, Twitter or Instagram. Used by Chicago, Houston, Nashville and other large districts. Beyond these market leaders, the remaining half of the U.S. public/private K-12 market is very fragmented. At LearnSprout, we’ve had interest come from districts using a plethora of different SIS’s. To date, we’ve recorded nearly 100 different systems. Most of these other systems tend to be either home-grown systems, or legacy products that schools haven’t yet replaced. In the chart below, I attempt to visualize the distribution of students across the different types of student information systems for all public and private schools in the U.S. As you can see, a small group of SIS companies serve nearly half of the U.S. K-12 public and private student population. The other half is being served by many small companies. It’s a little hard to believe; the modern web-based SIS has been around for more than two decades, but many schools are still using old client-server technology. To be fair, replacing an SIS is a little bit like getting a new roof… You put it off as long as you can and only act once leaks start to happen. It’s expensive, difficult to install and on the surface, seemingly offers little perceived benefit over the old roof. The thing is, those leaks are things like private student data falling into the wrong hands, historical grades getting corrupted or GPA’s calculating incorrectly. When this happens, it won’t matter how much Mom and Dad spent to augment little Johnny’s education or how many millions a district will spend on new Common Core-aligned curriculum. If the SIS isn’t ship shape, Johnny’s not getting into Harvard. The funny thing is, this probably happens more than people realize, which is to say… I think it happens a lot. 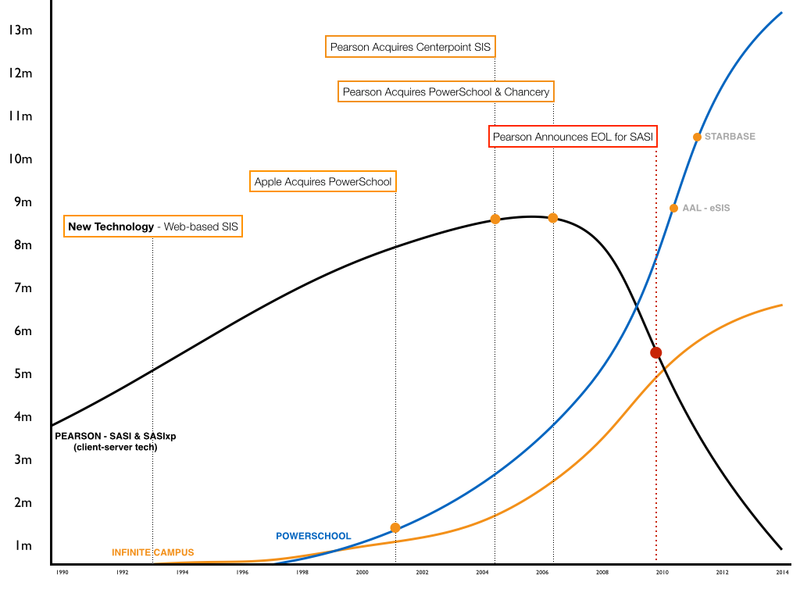 Today I believe we’re over the hump of the technology adoption lifecycle for web-based student information systems. Early adopters have been using systems like PowerSchool and Infinite Campus for nearly twenty years and the Late Majority are finally beginning to make the switch. This leaves the SIS market with only Laggards to look forward to. With a diminishing pool of customers, competition between SIS companies will become even more fierce as they begin to turn on each other and attempt to steal customers from one another. This suggests an opportunity for newcomers to attract forward-thinking small schools and districts who may now view their existing system as bloated, expensive and difficult to maintain. The Chasm that new SIS companies will have to cross is state reporting. I’ve said for years now that there is a growing appetite for a new, lightweight SIS among private and small charter schools who find themselves over-served by their current SIS. Recently, a handful of new companies have entered the fray and are beginning to make waves. Alma leverages a sleek design and seamlessly incorporates an LMS, effectively replacing the traditional grade book. Illuminate has leveraged the popularity of their DNA analytics solution to seamlessly fold in a functional, albeit lightweight SIS. Jupiter Ed has leveraged the popularity of its grade book to build an SIS that also includes a LMS. All three companies show a great deal of promise, but when it comes to barriers to entry, few markets face the same kind of brick wall that exists with an SIS. The Great Wall of China in the world of student information systems is state reporting. This function represents but a small portion of what an SIS is responsible for, but it’s anything but small. For SIS companies, staying abreast of reporting requirements for each state requires a dedicated state reporting department. It’s expensive and the costs are passed down to schools. If you think I’m exaggerating, I’d like to invite you to check out the documentation for the California Longitudinal Pupil Achievement Data System. (Note: The PDF is 30MB!) The next time you hear someone complain about how expensive education is in America, send them this. It’s enough to make anyone throw their hands up in the air and say “Screw it!” and lord knows, SIS administrators who suffer through these reports say this every day. If companies like Alma, Illuminate and Jupiter want to break into mainstream SIS adoption, they’re going to have to find a solution for state reporting. Unfortunately, there’s no fast or easy way to do this. Gathering requirements, designing product specifications, coding, and testing is an extremely labor-intensive endeavor that never ends. States change their requirements on a yearly basis so the job is never done. For the past seven years or so the SIS market has been experiencing a shakedown of sorts. Pearson went on an SIS acquisition binge, purchasing and subsequently end-of-life-ing a variety of legacy SIS products, the most recent being Century Consultants’ Starbase SIS in July of 2012. Beyond acquisitions, there have been a several implosions. In 2011, Zangle, one of the leading SIS products in California, filed for bankruptcy and just last year, Los Angeles Unified’s “MiSiS” SIS disintegrated into one of the most spectacular technological disasters in K-12 history. This disruption in the SIS market was recently escalated with the announcement from Pearson that it intends to sell off all of its SIS assets, including PowerSchool. The introduction of web-based technology resulted in the last disruption of the SIS market. Y-axis represents number of students in millions. The recent sale of PowerSchool to Vista Equity Partners has caught many by surprise and has huge implications. In my next post, I’ll talk about the announcement and why I think it’s good news for PowerSchool and the SIS market in general. I’ll also talk about a new technology entering the SIS space that has the potential to disrupt establish market players much like the web did back in the mid-90’s. UPDATE 9/19/18 — This post was a bit of a swan song as the company I was working for at the time got acquired by Apple. My attention span on the SIS space was subsequently reduced to nil. I had planned to write a follow-up post speaking to the potential of PowerSchool’s fairly robust API to finally deliver on the promise of “best of breed” solutions. With the API, PowerSchool has the potential of delivering seamless, two-way integration with virtually any school/district management software. This would allow schools and districts to choose the best LMS/discipline management/SPED/formative assessment/etc. solution to suit their needs and have data flow between systems in real-time. Sadly, the new leadership at PowerSchool had a different strategy in mind and began acquiring EdTech companies at a breathtaking rate and scope. With this, many partnerships with other vendors were severed as the company began using their leverage to entice schools to adopt a newly acquired company in lieu of whatever solution they either had in place or were considering. Put simply, PowerSchool is moving to position itself as THE K-12 educational software suite — a one-stop-shop for everything related to running a school or district. This may sound appealing to some, but the lack of competition will result in higher costs for schools while receiving a reduced rate of innovation. More concerning is what is happening inside PowerSchool under the ownership of private equity. After I left PowerSchool in 2012 I maintained my friendships with everyone at the company and have been getting many reports that concern me. I wrote about this HERE.